ONZ Architects wins the Holcim Gold Award. 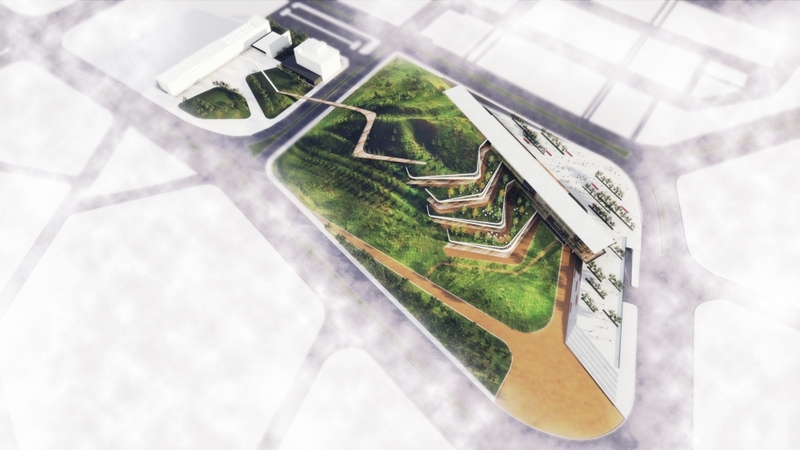 ONZ Architects wins 1st Prize in Moscow Architecture & Design Awards with Ostim Eco-Park Technology Development Center. Ostim is an organized industrial region located in Ankara/Turkey. An Eco-Park for sustainable research and technology is planned for the region to promote sector stakeholders to compete in a global level and attain a position where they would export to the world new energy and environment technologies. The primary design decision in Ostim Eco-Park was to create a pleasant sharing space for its users with minimum interference to the nature. The project, designed in the intersection of man-made and natural, aims to leave most of the site to the green therefore the hill in the site is used for housing offices, conference and workshop spaces in terraces underneath the green texture. The building situated on the south of the site is designed as a landmark for the area and is in close contact with the terrace structures in different levels. The terrace buildings offer a working environment intertwined with nature while the large spaces in front of them provide a suitable place for a wide range of activities like workshops or sustainability experiments. Eco-Parks differ from other working environments by highlighting the importance of collaborations and exchange of ideas. It is very crucial for Eco-Park organizations to follow recent developments in the field, come together and develop new ideas and technologies for a more sustainable future. In this context, the project designed for Ostim Eco-Park encourages these collaborations both in urban and architectural scales, gives the opportunity to experiment and share vibrant developments and creates an inspiring working environment for the employees. Besides the conference and meeting halls in the terrace buildings, the red hall in the main building is probably the most prominent gathering space for collaborations and sharing new ideas. This venue will evolve into a landmark of Ostim Eco-Park where not only the Eco-Park employees but also everyone who is interested in sustainability and particularly Ostim personnel would benefit informal encounters, stimulating communication and exchange of ideas. The amphitheatre in the red hall is designed so that it can be used both for crowded events and smaller gatherings by dividing the space with partitions. With its sleek and spacious design the red hall is a part of everyday working life of the EcoPark with its open space design, location and function and its private cafeteria. This will serve to the gathering function of the space, furthermore provide a pleasant place for workers where they can just relax and enjoy a stimulating conversation.